Why is it better? The person on the other end feels like they're talking to a human being, not a salesperson. It reduces their defensive responses and opens them to actually talking with you -- just like you're talking to them. There is one part of your strategy that I needed to substitute though - the action you're driving to at the end. I explain to my sales team that asking people to call you back is a bit obnoxious - even if there is value and reason. When you do that your prospects are left thinking, "Wait, you want me to call you? So you can pitch me? You want me to stop doing my job and search for time in my calendar to give you so that you can sell me? Are you kidding?" Example 1: "I have time free on Friday, July 6th at 2:00pm. I'll reach out to you then to discuss. I hope you're able to take my call." Example 2: "I'll reach out to Mary to see if you have some time free to discuss next week." Showing that you've done your homework. Example 3: "I have time free on Friday, July 6th at 2:00pm. Are you free at that time to talk?" Still asking them to do something, although it's minimal. They just need to check one date/time in their cal. Giving them enough time (at least a week out) to ensure that they'll have a free spot on their calendar. Sometimes I'll offer two times a week out for them to choose from and then say, "Which date/time works best?" By taking this approach, I'm applying a successful passive/aggressive strategy. I'm able to send 3 to 5 emails and make 3 calls without annoying the prospect...which isn't easy. If I don't reach them, I leave a voice mail and send an email stating, "I guess this didn't turn out to be a good time. Let's try again for Wednesday at 3pm." On the morning of my proposed meeting I'll send an email stating, "As per my message, I'll be calling you today at...I hope that we're able to connect. Please let me know if that time doesn't work." I'll continue this for 3x per prospect, then back away. After the 3rd attempt, I usually say, "I guess this time frame is way too busy for us to connect. I'll try again in the future. In the meantime, feel free to contact me..."
I try to splice the attempts with value. Before the scheduled call attempt, I may forward them an article stating, "This company looks like they are going through the same thing as you...check out their approach". Or on a VM, stating, "By the way, B2B magazine has a whole section this month of the financial services vertical and I know that's a big focus for you guys." I love the simple elegance of Daniel's approach. The moment I read/heard it from a customer's perspective, I knew it was much more effective. P.S. 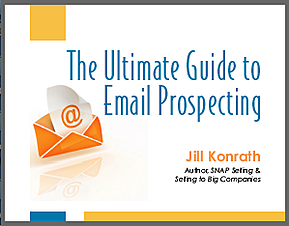 Get your free copy of Ultimate Guide to Email Prospecting. You need to find out what comes before the "closing" comments. Question: Would you respond better to this closing than your typical approach? What else works well for you? Share your comments now.